The second Halloween ended all I could think about was Thanksgiving and what I would be making. I always make a succulent, juicy Maple Brined Turkey, some tasty stuffing like these Apple Sausage Stuffing Bites and Sweet Potatoes in Orange Cups, but I tend to switch up the bread I serve. The kids always want me to make Tiny Corn Muffins as they're cute as can be and remind me of what my grandmother used to make. This rewind Wednesday I'm going back to a simple recipe that you can turn into Cranberry Cornbread Stuffing or serve on their own! 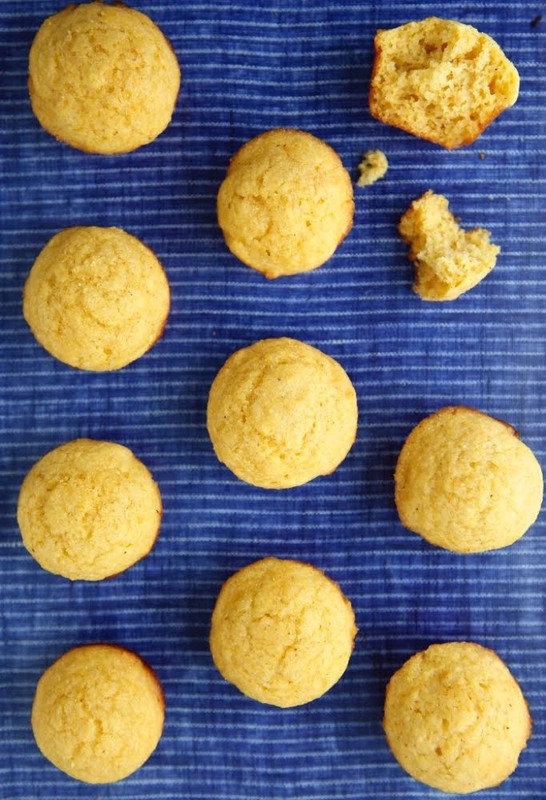 As a kid growing up in the south, cornbread in any form -- be it sticks, muffins, whatever -- was a staple. My grandmother used to take her old seasoned cast iron corn pone mold (a southern style cornbread) and grease it with fat drippings she kept in a jar above the stove. Then she would fill it with sweet corn batter which came out crisp, tender and delicious. I just can't imagine how many calories there were! Sadly (or should I say "fortunately" -- sorry grandma! 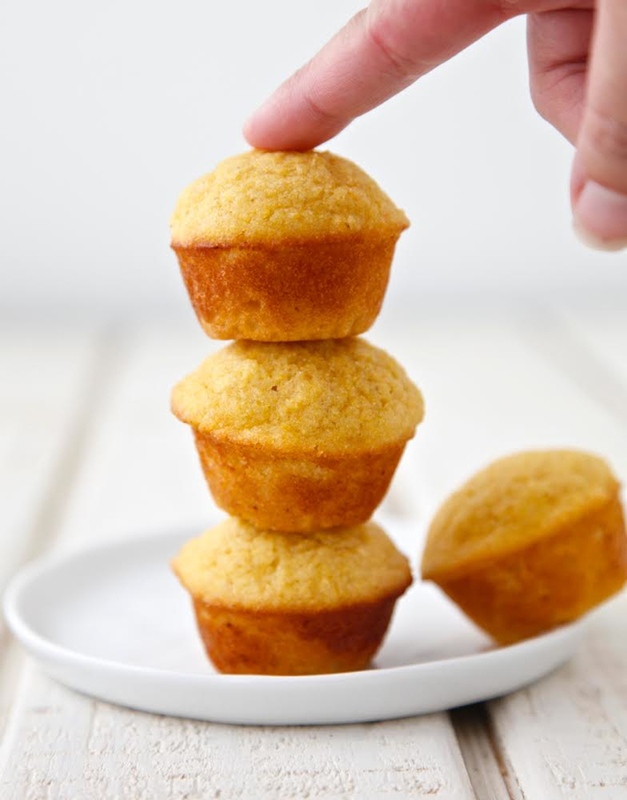 ), we don't keep a jar of drippings in our kitchen, but the taste of these muffins run a very close second, are healthy and they only take minutes to prepare. I especially like this recipe because they have a crunchy top, a tender middle and they're perfectly sweet from the agave instead of a cup of sugar like my grandmother's recipe calls for. 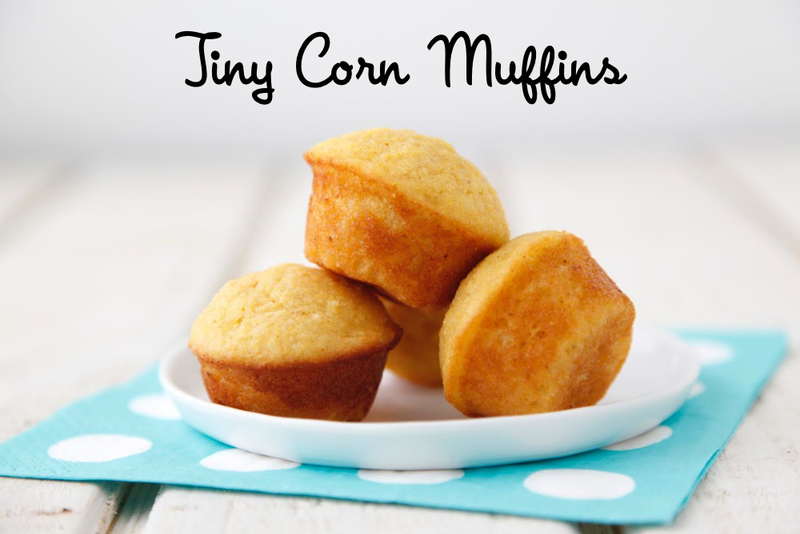 I made 2 dozen of these Tiny Corn Muffins thinking I would have plenty for days. Nice try, they were gone within 48 hours. My husband would eat like five in one sitting. Oh well, better double the recipe next time. 2. Mix the first 5 dry ingredients in a bowl. 5. Pour into 24 greased mini muffin cups. Loved the texture! Perfect sweetness. My kids LOVED the crunch on the outside. Thank you for another great recipe. These are great! I made a few changes such as sneaking in some ground flax seed and using some whole wheat but my whole family loved these. I am loving your blog! 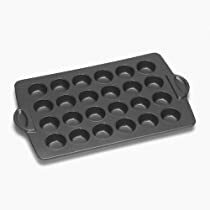 When making regular sized muffins, do I have to change the temperature/bake time? went to Whole foods to pick up ingredients and there are several types of Agave...blue, amber, light, etc... does it matter which kind? Thanks!! how did you have these perfect flat tops? My mom used to put peanut butter and/or jelly in the middle (fill cup halfway, add dollop of pbutter/jelly then top off with mix) of our corn muffins. Going to try it with this recipe -- she used the box mix. Super yummy surprise!! Could/would you use molasses instead of honey/agave? I got more like 40 mini muffins out of this recipe and I filled the cups. Maybe all mini-muffin tins are different sizes? Anyway, they came out great. Not too sweet, which is often a complaint I have about corn muffins--some taste more like vanilla cake. Makes more than 12 regular sized muffins, FYI. Batter tasted good and my kitchen smells amazing. How many is a serving? Didn't see it in the nutrition info. Yes! Freeze for about 30 minutes in a single layer to prevent sticking before transferring to a freezer bag or other freezer safe container! Do you think adding black beans and some cheese for a tex-mex type feel would work? I'm looking for a something with a little protein for our veggie lunches. There are so many cornmeal texture, which one should I use? I like to use a finely ground cornmeal! Looks yummy! My lil ones have food allergies so I'm Going to try this with flax eggs and gluten free flour! Is it bad that I really want your Grandmas recipe? Can I substitute raw honey or sugar for agave? You can substitute honey for agave at a 1:1 ratio! What do you suggest I use as an egg substitute (I unfortunately can't use flax). THank you! You've suggested using 1/4 applesauce : 1 egg ratio for recipes that are sweeter… and it worked wonderfully. Will applesauce work for a more savory recipe? Can I substitute avocado oil for the vegetable oil? Thanks! I don't have buttermilk. Can I use regular milk? I made these today and they turned out great. I even left out the oil and it still turned out soft and yummy. I gave me 28 tiny muffins. 425 degrees was a bit high, so watch to make sure muffins don't burn on the bottom. They rose so well and they were nice and golden. I had these with my chicken, quinoa, bean, veggie chili. I would definitely make these again and even my 5 year old was able to help me, because it was a simple recipe. Thank you! Lovely recipe! Came together so quickly. My kids will have them with honey butter in the morning. I never usually sub a recipe but I did use butter instead of oil because well, butter. Thanks for the recipe! So glad they were easy for you and I hope your kids love them!